The first and most important decision an e-commerce company must make is choosing the right platform on which to built its online site. 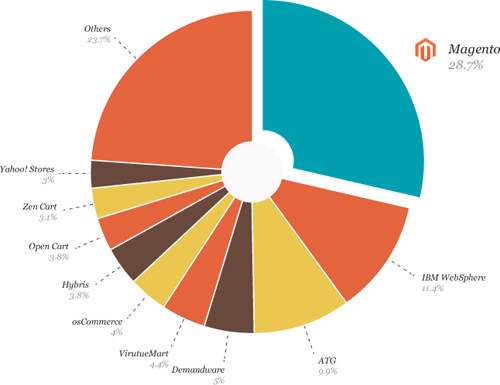 Magento, with nearly 30 percent marketshare, is the one most-often selected for this purpose. While several online resources providing tips for creating a successful Magento site can be found online, keeping track of all the guides and tips can be a daunting task. Moreover, it becomes a bit overwhelming for beginners to determine the ideal way to begin with Magento website development. For the purpose of saving time, here are three ways to grow a Magento site, and which happen to be the most effective. Even though, the usage of mobile devices is increasing at a fast pace, there are plenty of online businesses that haven't gotten the message how the introduction of new and modern mobile devices has changed the way people shop online. Besides user behavior and preferences, the latest mobile-friendly ranking algorithm released by Google, according to which "mobile-friendliness will serve as the ranking signal" has made opting for responsive designs a necessity than just a passing trend. Thus, not making a Magento site mobile-friendly will likely result in poor search engine rankings. 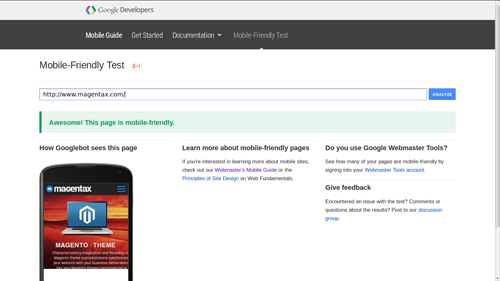 Luckily, Google's new Mobile-Friendly Test Tool makes the process of testing whether a Magento website is supported by mobile devices or not pretty effortless. All of these factors, clearly suggests that it has become more important than ever to ensure that a Magento powered e-commerce site facilitate enhanced mobile user experience. One of the best ways to achieve such an objective requires switching to a responsive design solution. NOTE: Luckily, there are many Magento themes (both free and premium ones) available online that features a responsive design. After picking any one of the available themes, it is important to test whether the chosen theme is mobile-friendly or not using Google's tool to test mobile-friendliness of a Magento-powered site. The continuous increase in mobile traffic to Magento sites is also being fueled by the rise of social media in the e-commerce industry. According to ComScore analysis, social media helps attract consumers to online retail sites. 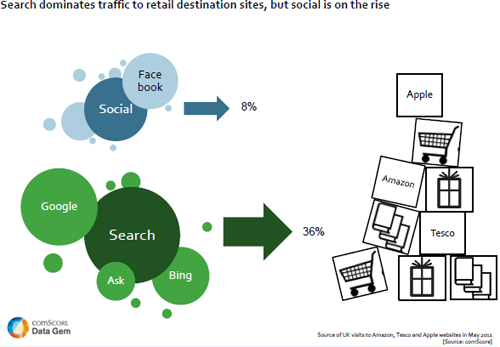 Further, it was observed that while search engine giants such as Google and Bing accounted for 36 percent of traffic to e-commerce sites accessed via Apple devices, Facebook accounted for 12 percent of traffic. Social media networks also provide online retailers the opportunity to establish relationships with a wider audience base. That's because, social networks help fulfill the psychological urge of consumers to talk and share their interests with other people having similar liking. In fact, many retail brands are focusing to increase their presence on social media – be it a Facebook page, Twitter or other social networks. The more 'likes' or 'retweets', any website will receive, the greater will be its reach. However to make the best possible use of social media – a couple of social media strategies need to be adopted – that helps encourage people to view the products of a Magento website – which ultimately leads to increase in sales. The last and vital strategy that needs to be followed is to find ways to encourage visitors (ideally existing customers) to revisit the site, time and again. An excellent way to fulfill such need requires creating and maintaining email marketing campaigns – that provides customers with some exciting (hard-to-resist) offers and promotions into their inbox – every week. Doing so, will help boost the sales – and not to mention – increase the return of investment via promotional campaigns. However, there are a lot of factors that needs to be considered for making the email campaigns successful. First off, performing Split testing (or A/B tests) on email marketing campaigns is required, as it can help in optimizing email open and click through rates. Secondly, creating emails asking customers reasons behind not completing a transaction is important. In addition, creating reward emails for loyal customers with special discounts or gift rewards proves to be the most effective way to encourage customers to stay with a site. Lastly, for the dormant customers (ideally the ones who've visited a Magento site but didn't purchase anything), a viable solution is to send personalized newsletters with “deal of the day” and other special offers compelling them to reactivate their account. Setting up a Magento website and paying attention to the aforementioned simple strategies will definitely prove a great way to attain success in today's wobbly online marketplace. Claudia Jhonson is a professional web developer working with Magentax Ltd.,- a renowned Magento Development Outsourcing Company. You can choose the company in order to hire offshore Magento developer who's skilled in offering high-end Magento development services and solutions. Do go through Claudia's well-written, informative articles on Magento web design and development.